The Muscarelle Museum of Art has been enclosed by a fenced-off construction site since last summer, slated for an extensive renovation project. 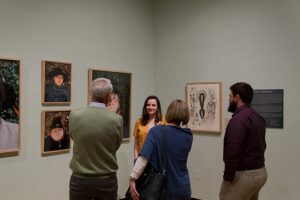 In February, under the leadership of the museum’s new interim director David Brashear, the museum announced it would be able to postpone renovations to allow its lower galleries to be used for students at the College of William and Mary to curate their own exhibition. The exhibition, “Objects of Ceremony: Effervescence, Decay, and the Everyday,” opened April 5 and will be on view until May 31. 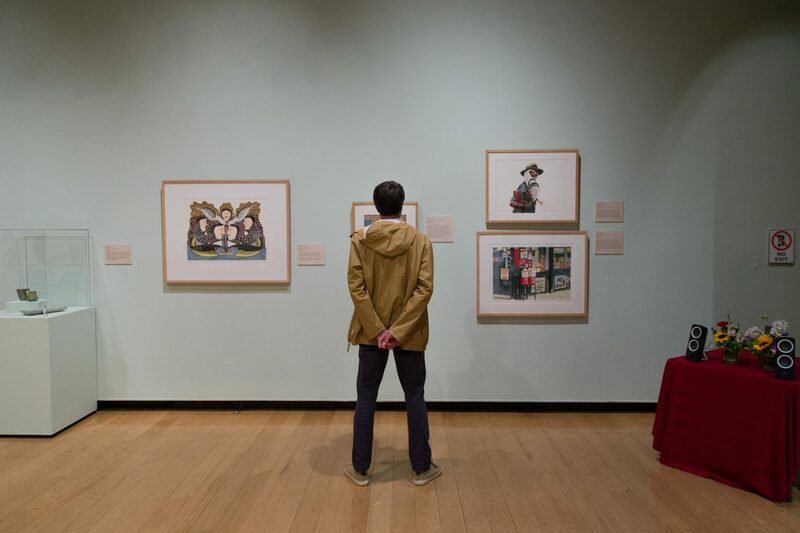 This show is the product of the first-ever class of The Curatorial Project, an art history course taught by professor Allan Braddock to give students hands-on experience as museum curators. “We’ve known for a while that a lot of our students are interested in pursuing that kind of career, and so it’s a great way to get people out of the classroom and roll up their sleeves and work with actual works of art,” Braddock said. The show came together as a semester-long effort from 17 student curators. At the beginning of the semester, the students did not even expect to be able to use the Muscarelle space or collection, since the museum was meant to be closed this academic year. However, after Muscarelle director Aaron De Groft ’88 stepped down at the end of 2019 and Brashear took over, the museum ended up staying put, and the scope of The Curatorial Project increased. Braddock established the exhibition’s overarching theme of ceremony, but gave the class freedom to curate the show as they chose. 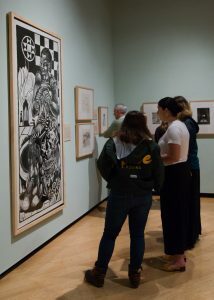 With most of the museum’s larger paintings in storage offsite, pieces from the Muscarelle’s collection of prints and the William and Mary Libraries Special Collections Resource Center make up the bulk of the exhibition, along with faculty photography, paintings and ceramics pieces from current undergraduate Indigo Cristol ’19. “I know professional museums and professional curators who would find this to be every bit up to the standard of their museum,” Braddock said. Four themes divided the exhibition into sections: Endings as Beginnings, Rituals in Repetition, Elevating the Everyday and Considering Color. Clara Poteet ’20, one of the student curators of the Rituals in Repetition section, said that her group aimed to contrast mundane and grandiose rituals of ceremony. “We were looking at how everyday rituals become almost imbued with ceremonial qualities in their repetition, and then also how the repetition of formally recognized ceremonies almost creates a sense of decay because they’re personalized and they turn into other ceremonies,” Poteet said. 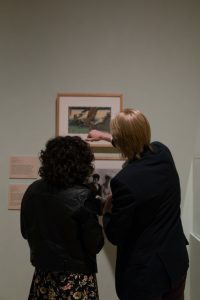 Poteet pointed out two wedding scenes in the exhibition — “Act VIII: The Bridal Journey” by ukiyo-e master Ando Hiroshige, and below it “Bratsk, Siberia,” an irreverent wedding photograph by Elliott Erwitt — as examples of this dynamic. The two distinct wedding depictions draw attention to how the ceremonial can become something repetitive and ritualistic. Only a few feet away, Jon Gilbert Fox’s “Easter Morning Coming From Harlem” photograph depicts a woman dressed formally for Easter Sunday on the New York City subway, displacing a formal religious ceremony in the repetitive mundane world of public transportation. Below the Fox print, “Der Verkehr (The Traffic)” by Peter Angermann displays a bus in traffic, with the scene becoming increasingly abstracted and forming a spiral of red, almost violent brush strokes, rendering a repetitive ritual into an erratic ceremony. 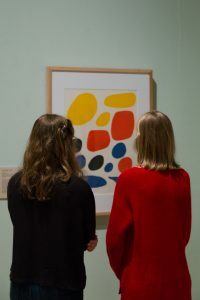 However, Poteet’s favorite pieces in the exhibition — the “Untitled” Alexander Calder lithograph and Wayne Morton Thiebaud’s “Eight Lipsticks” etching — deal with repetition both physically and thematically by emphasizing the ceremonial qualities inherent in art-making broadly, and printmaking in particular. “Both of them are prints, and so they are one of many and the same actions have been taken to produce them, but they are not the same as the other prints in the series,” Poteet said. “Eight Lipsticks,” with its vibrant vertical lines in primary colors, is positioned next to four sketches by Gene Davis: studies for what would become “Sun Sonata,” the colorful vertical line composition on the exterior wall of the Muscarelle. The two pieces stand in conversation with each other; the human scale of the makeup supplies brings out and the architectural dimension of the “Sun Sonata” sketches, and the same is true in reverse. “Printshop, summer,” a painting of the College’s printmaking studio by art professor Brian Kreydatus, also plays in to the variations of the printmaking motif. In the exhibition’s Elevating the Everyday section, one particularly poignant corner of the gallery depicts domestic scenes of mothers with their children. The corner first introduces a towering seven-foot-tall print from Steve Prince — the Muscarelle’s Director of Engagement and artist-in-residence — titled “Sow.” The print depicts several generations of women in Prince’s own family. The central figure is his mother as she sews a quilt, with careful attention being drawn to the delicate figure of the sewing needle in the center of the canvas. In the folds of her quilt, dozens of scenes play out at once, depicting pivotal moments in African-American history and in Prince’s own family history. While staggering in its scope and execution, “Sow” ultimately marvels as an intimate, evocative familial scene. One of the Elevating the Everyday curators Alijah Webb ’20 cited this “domestic” corner of the gallery as her personal favorite. But Webb’s acuity for finding vital topics in art extends beyond the brick-enclosed campus of the College. Last year Webb curated “Phosphene,” a solo show at the Aurora Studio Center in her hometown of Roanoke, Virginia, and she is currently curating another show, “Dreams and Nightmares,” which centers the lives and experiences of black women and opens at the Liminal Station Gallery this June. For Webb, curating this collaborative Muscarelle show has fulfilled the course’s ideal of providing more hands-on experiences for art history students. Being a part of “Objects of Ceremony” has only continued to inform Webb’s vision of the kinds of shows she wants to have a hand in curating in the future, which in her case, hits close to home.